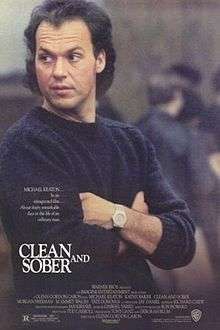 Clean and Sober is a 1988 American drama film directed by Glenn Gordon Caron and starring Michael Keaton as a real estate agent struggling with a substance abuse problem. This film served as Keaton's first dramatic departure from comedies. The supporting cast includes Kathy Baker, M. Emmet Walsh, Morgan Freeman, Luca Bercovici and Tate Donovan. Daryl Poynter is a successful but self-destructive Philadelphia real estate salesman who is addicted to cocaine. He embezzles $92,000 of his company's money from an escrow account and then loses $52,000 to his addiction and the stock market. Waking up one morning next to a girl who suffered a heart attack from a cocaine overdose, he tries to cover up the drug use, but the police make it clear that they know what happened. There is also the matter of the company's money. Daryl goes to the airport to try to flee the country but his credit card is declined and he has no cash. His colleague Martin also refuses to put him up for a couple of weeks. Daryl then learns of a drug rehabilitation program which lasts about a month and which guarantees anonymity. He checks in, figuring he can hide out there. While in rehab he meets Craig, a tough but supportive drug rehabilitation counselor. With great difficulty, Craig helps Daryl to realize he is an addict and that his life is complete chaos. He says to him, "The best way to break old habits is to make new ones." At a 12-step meeting, Daryl meets the older, reformed addict Richard Dirks, who will act as his sponsor. Richard eventually encourages Daryl to confess at work what he's done with the money. He is promptly fired. Daryl becomes attracted to a fellow patient, a woman named Charlie Standers. She is a steel foundry worker who is addicted to alcohol and cocaine. Charlie is involved in an abusive relationship with her boyfriend Lenny, a fellow addict to whom Charlie acts as a codependent. Daryl falls in love with Charlie and urges her to leave Lenny. He finally succeeds, only to witness Lenny's manipulative way of winning her back. Daryl tries to remain in Charlie's life to help her stay sober. After another fight with Lenny, she leaves the house, attempts to use drugs (and perhaps return to Daryl) and is killed in a car accident. In despair, Daryl also feels a strong temptation to return to drugs. He visits Richard, who talks him out of it. Near the story's end, Daryl, confused but hopeful and reborn, accepts his 30 Day Sobriety Chip in front of an audience of fellow members, as he tells his story. The film ends with a distorted shot of cars taking off into the night. Michael Keaton won the 1988 National Society of Film Critics Award for Best Actor for his performances in both Clean and Sober and Beetlejuice. ↑ Ebert, Roger. "Clean and Sober, August 10, 1988". Roger Ebert. rogerebert. Retrieved 4 November 2011. ↑ Variety Staff (31 December 1987). "Clean and Sober". Variety Reviews. Retrieved 4 November 2011. ↑ "Clean and Sober (1988)". Rotten Tomatoes. flixster,inc. Retrieved 4 November 2011. ↑ "Clean and Sober". Internet Movie Database. IMDb.com, Inc. Retrieved 4 November 2011.